High quality, professional oil paint at a reasonable value! Working with over 145 years of tradition and advancement, LUKAS has created a high quality yet economical oil paint for the discerning artist! LUKAS Studio Oils are made with the same high quality pigments and exclusive blend of linseed oil, sunflower oil and beeswax as their master line of 1862 oil paints. All toxic, caustic, and expensive pigments have been eliminated from the line, leaving you with a well-balanced but affordable spectrum of brilliant colors. Loaded with pigment, LUKAS Studio Oil Paints have exceptional covering power, and the high-quality linseed oil, sunflower oil, and beeswax binder makes for even drying and a strong paint film. Painting more, worry about cost less! Working with over 145 years of tradition and advancement, LUKAS has created a high quality yet economical oil paint for the discerning artist! 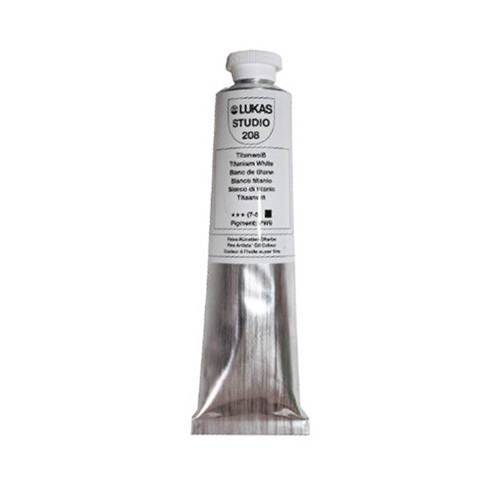 LUKAS Studio Oils are made with the same high quality pigments and exclusive blend of linseed oil, sunflower oil and beeswax as their master line of 1862 oil paints. All toxic, caustic, and expensive pigments have been eliminated from the line, leaving you with a well-balanced but affordable spectrum of brilliant colors. Loaded with pigment, LUKAS Studio Oil Paints have exceptional covering power, and the high-quality linseed oil, sunflower oil, and beeswax binder makes for even drying and a strong paint film. Dry to the touch in 2 to 4 days and available in 37ml, 75ml and generous 200ml tubes means that you can work large and quickly while not breaking the bank! With a range of 48 vibrant colors all at the same price, LUKAS Studio Oils are a professional paint at an affordable cost, and are sure to become a staple in your studio! Great quality professional paints at amazing prices! "As a test, I laid down my current stock of colors fron W & N next to the same Lukas colors and noticed right away there was a difference in both consistency and color intensity. Every one of the Lukas colors was more pure and covered the canvas paper better. one of the colors I ordered was the cobalt violet. This is not a color I've seen anywhere else and I have to say, it's lovely. I much prefer it to dioxazine purple." BUY 3+ Tubes of qualifying Lukas Paint lines and GET (1) Tube of White (up to a $27.15 value) FREE! *Buy 3 or more open stock items and receive one free tube of white! LUKAS Studio Oil Color Paints is rated 4.8 out of 5 by 84. Rated 5 out of 5 by Slmoore from Buttery and smoothe I learned about Lukas paint from my art teacher and now only buy Lukas. The paint is softer and easier to manage without getting dry and hard to open. Also like that the tubes are colored and easy to find in my supply box! Excellent value. Rated 5 out of 5 by Connielea from Great quality, good price I bought several tubes of Lukas oil paints and I love them. They are very good quality. Rated 5 out of 5 by Twiggy2 from Fantastic colors ! I had been trying to find a green color for some time, but hadn't yet been able to find the right one. But I found this LUKAS Studio Oils and a color called Earth Green ! So, I ordered a tube of LUKAS Earth Green oil paint. And I am so glad I did ! This is so spot on to the color I was looking for I couldn't believe it !! I will definitely be ordering more ! And the prices just can't be beat ! Thank YOU SO MUCH !! Rated 5 out of 5 by JanetT from Great product. I really like how this oil paint is smooth and is great to us.